We will look forward to seeing you on Tuesday February 11, 2014. Time: 8:30 am to 10:30 am. Networking starts at 7:30 am. Park in the SOUTH LOT of the UMass Boston Parking Lot. This parking area is to the LEFT of the Student Campus Center (The Large White Building to your LEFT when you are driving on campus). This lot fills up quickly, so arrive EARLY to secure a parking space. There are other parking lots on campus if you are not able to find a space the South Lot. 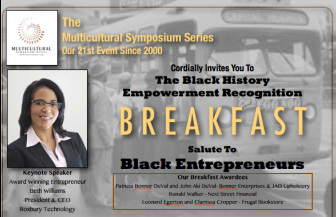 THIS IS OUR 21ST BREAKFAST EVENT SINCE THE YEAR 2000. For complete directions, travel information and parking for the UMass Boston Campus. Or....take the MBTA - Red Line-- to JFK. Take the FREE Shuttle to the UMass Boston Student Campus Building. You will probably park your car or catch the shuttle and enter the Student Campus Building. Get off and follow the signs to the Ballroom for the Black History Breakfast.